Human populations are concentrated on coasts, where they often depend on aquifers as primary sources of water for drinking, agriculture, and industry. In coastal aquifers, usable fresh groundwater floats on top of a wedge of denser saltwater infiltrating underground from the sea. Pressure generated by fresh groundwater in coastal aquifers resists the landward movement of seawater. Unsustainable aquifer use through the over-pumping of wells and springs reduces fresh groundwater volumes and allows for the intrusion of seawater. This is especially problematic in aquifers where bedrock fractures and underwater caves are present, since seawater can rapidly infiltrate inland along these large groundwater flow-paths. Underwater caves often discharge groundwater at the land’s surface, producing springs. Seawater intrusion into such caves can quickly make their associated spring water undrinkable. 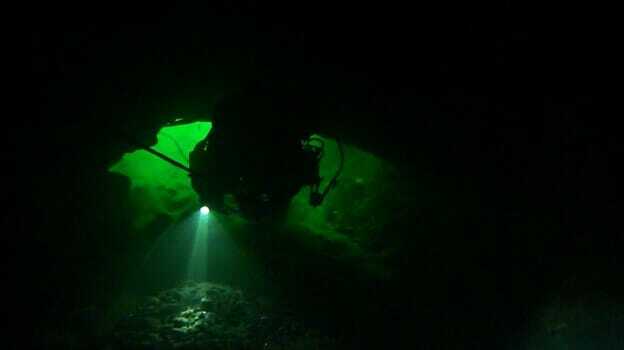 Underwater caves are also homes to specially-adapted microbial colonies, crustaceans, and fishes. Increasing the salt content in cave water might make these unique ecosystems uninhabitable for their native populations. 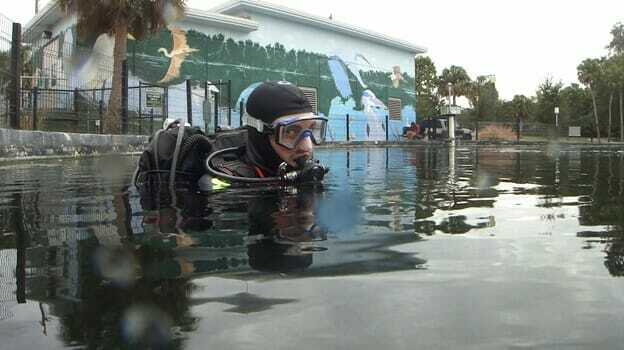 We studied Sulphur Springs, an underwater cave/spring system developed beneath metropolitan Tampa, Florida, USA. Over the past century, the spring has become increasingly salty, and our goal was to find out why. In doing so, we also identified potential ecosystem impacts of seawater intrusion in this cave. Our first step was to consolidate the historical information relevant to this site. The large pool produced by Sulphur Springs was a tourist destination for many decades in the early twentieth century, when the spring water was still fresh. In the 1960s, the city began pumping Sulphur Springs water to supplement the local Hillsborough River reservoir during droughts. In 2002, the pumping system was modified to allow for extracted Sulphur Springs water to be diverted directly to the Hillsborough River below the reservoir dam. This modification allowed the city to use Sulphur Springs water to mimic Hillsborough River freshwater flow, preventing seawater from moving inland along the river channel, thus supporting low-salinity fish habitat and manatee thermal refuge in the estuarine portions of the river. Our examination of historical Sulphur Springs salinity data revealed two consequences of municipal water pumping at this site. The first could be noticed on the short-term: extraction activity can lower Sulphur Springs pool level by about a meter, causing rapid salinity spikes in the spring water. The second was that Sulphur Springs salinity has increased by about ten-fold since before groundwater extraction began at this site. Using salinity data alone, it was unclear where the saltwater was coming from — many aquifers contain layers of saline water that are unrelated to modern seawater intrusion. We were also faced with an unknown mechanism by which saltwater was intruding into Sulphur Springs. By analyzing geochemical and hydrological data collected at Sulphur Springs and in the surrounding aquifer, we were able to find some answers. Our analyses indicated that the salinity increase at Sulphur Springs corresponded to an increased contribution of salty groundwater which geochemically resembled seawater. Where was this seawater coming from? The aquifer surrounding Sulphur Springs contained freshwater, and the underlying cave was too far inland to be a direct conduit for seawater intrusion. To pursue this question, we analyzed the characteristics of the aquifer on a regional scale and looked in Sulphur Springs Cave itself. With permission from the city and following the standards of our cave diving training and our university’s scientific diving program, we explored and monitored Sulphur Springs Cave with our research question in mind. 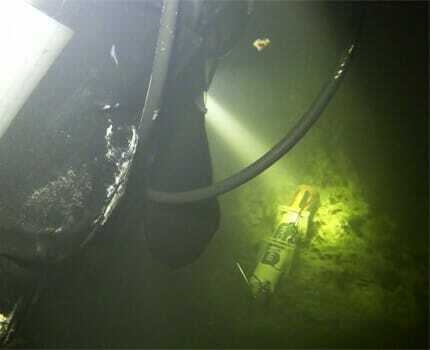 We discovered small vents scattered throughout the cave which intermittently issued warm, sulfidic, saline water and hosted distinct microbial communities. These vents were likely connected to bedrock fractures which drew up or intercepted the underground seawater wedge. Because of the complicated bedrock layering of the limestone surrounding Sulphur Springs Cave, the saltwater vents were at times more pressurized than the rest of the cave. 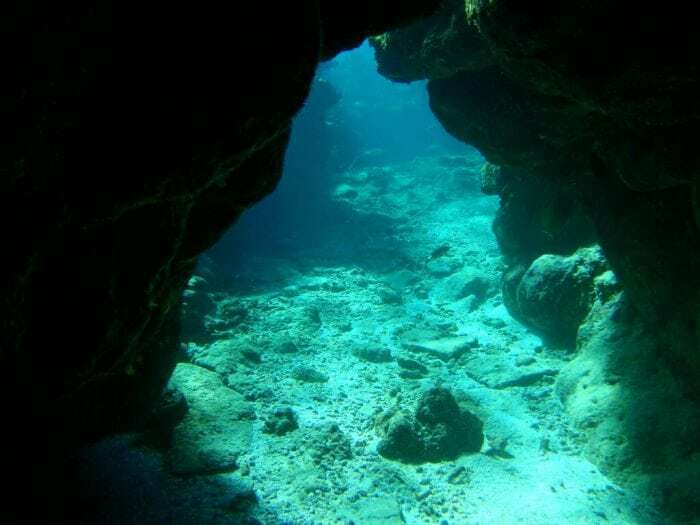 The vents were, therefore, able to contribute proportionately more saltwater to the cave when the spring pool level was lowered during dry-season pumping activity, and as regional aquifer level increased during wet seasons. The occurrence of a drought followed by Hurricane Irma during our study period made this trend very clear. Decades of groundwater extraction activity from Sulphur Springs pool and from the regional aquifer has likely caused the mixing zone between the underground seawater wedge and overlying fresh groundwater to expand, bringing saline water nearer to land surface — especially in the aquifer immediately beneath Sulphur Springs Cave. Additionally, pumping activity at Sulphur Springs occurring since the 1960s and greatly intensifying since 2002 likely allowed the fractures intercepting Sulphur Springs Cave to draw water from increasingly deeper into the seawater wedge. Our findings demonstrated the effect of direct groundwater extraction from coastal cave systems and showed the importance of considering regional aquifer structure and function when interpreting the dynamics of local features. Coastal caves, springs, and sinkholes are easy targets for groundwater extraction, but their complexity makes them vulnerable to mismanagement. The increasing urbanization of coasts is bound to impact these types of ecosystems worldwide, but their deterioration can be prevented by the development of science-based aquifer management plans. Our current research is focused on determining the ecological structure of Sulphur Springs Cave, which hosts dense microbial mat colonies. 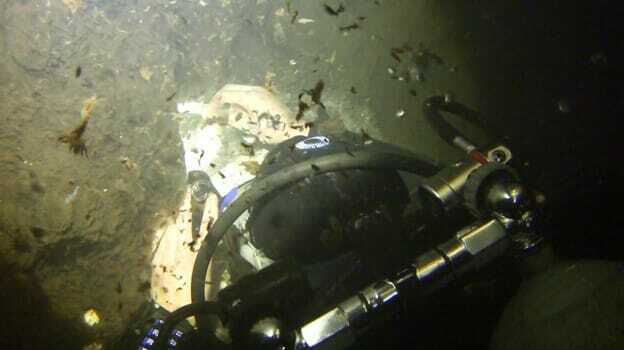 Some of these colonies depend on surface-derived organic inputs to the cave, while those growing near saltwater vents apparently produce organic biomass using chemical energy rather than photosynthesis, similar to the process used by bacteria in deep-sea hydrothermal vent ecosystems. Cave-adapted crustaceans living in Sulphur Springs Cave probably graze on these microbial colonies, and tufts of microbial mat washing out of the cave might contribute to the nutrient cycle of downstream ecosystems. We also hope to identify ecologically-relevant metrics that water resource managers can use to maintain healthy groundwater-dependent ecosystems. These findings are described in the article entitled The fate of urban springs: Pumping-induced seawater intrusion in a phreatic cave, recently published in the Journal of Hydrology. This work was conducted by Robert Scharping, Michael Garman, Ryan Henry, Prahathees Eswara, and James Garey from the University of South Florida. It was supported by grants from the Cave Research Foundation and the National Speleological Society. 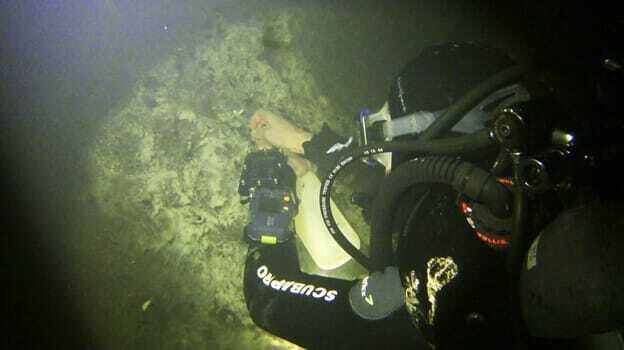 Robert Scharping is a Ph.D. candidate at the University of South Florida researching the ecology of underwater caves. His focus has been the genetic and stable-isotopic analysis of biofilms to discover the degree to which cave ecosystems are dependent on chemosynthetic primary production. His research is also focused on understanding how anthropogenic change to aquifers (e.g., through urbanization and groundwater extraction) impacts cave and spring ecosystems.